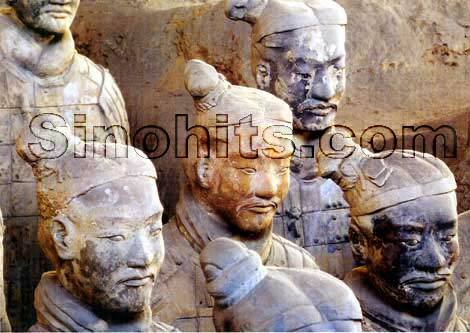 The underground army never ceases to stir up imagination and curiosity, and there are a number of unsolved mysteries or problems lingering around the terra cotta warriors and horses waiting for you to explore! A lot of the bronze swords excavated with the soldiers are still sharp and stainless after being buried for more than 2,000 years. Researches show that these weapons use some technologies westerners only invented in the 20th century. How people were able to process the surface of the swords at that time are still now known exactly. 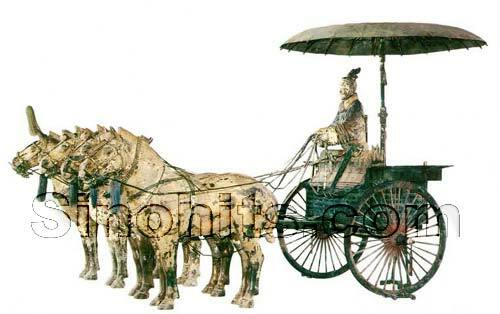 The making of the bronze chariot was also a wonder. One chariot usually consists of more than 3,000 components, and it¡¯s extremely hard to assemble all the parts together. Besides, the circular covering of the chariot is about two square meters, but only two to four millimeters thick. In order to produce it, the control of the temperature has to be very precise, and so does the portion of alloy. How people managed to produce that is still unknown today. There are also some problems about the producing of life-size terra cotta warriors. Today¡¯s process is to first fire different sections, and then glue them together, but the original warriors were all made as a whole. There are several technical problems for that. How to make sure the terra cotta does not break when it turns from wet earth mold to pottery? The thickness of a terra cotta varies in different parts of the body, how did people control the temperature of the heat? ?How did people manage the proportion of some ingredients like quartz in the earth? Answers to these questions are still left for you to give.